Shake it up! Your customers will appreciate it! — Marketing What's That? 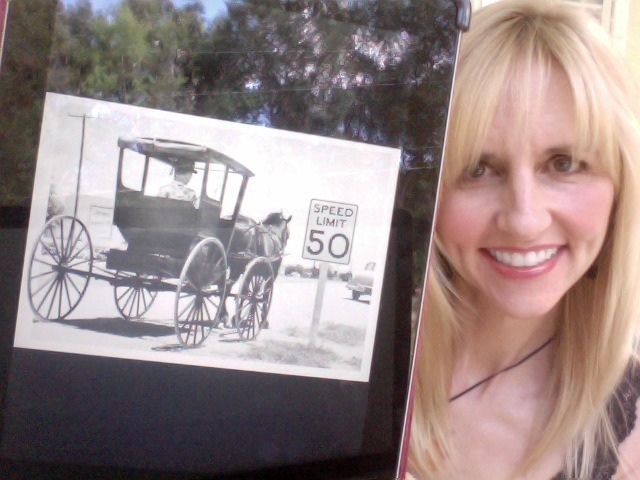 A while back, my husband Mark and I were having a conversation about Buggy Whips. Yes, I told him to pick some up on his way home from work today. Ok. No I didn’t. My point was that if you stay focused and constantly evolve your business, you will succeed, no matter what your product is, you just gotta wanna! Without passion for your business, you’re sunk! Focus will never happen and your passion will show up as crusty old paint chipping off your sign. Of course Buggy Whips came into the story as the contrarian point of view. It’s quite probable that Mr Buggy Whips could still be thriving today, with enough passion, laser focus and desire to adapt to the changing world. Along the way his Buggy Whip business could have evolved into a completely unrecognizable business from its’ infancy, yet still be alive and prosperous. Our mechanically inclined teenage son Benjamin suggested a line of engine starters called Buggy Whips, of course. Look at IBM. They started out as a tabulation machine company and have evolved to creating the first personal computers to “Computers that learn without programming. Chips that sense, learn and train themselves.” Yep that was right off their website, not in some sci-fi thriller! Look at GM’s luxury trucks. Even having the word luxury next to trucks was unheard of 20 years ago. But in time, GM tapped into the inner psyche of the American male, who was imbedded with a love of trucks since his toddler days. Then they dolled ’em up with some luxurious features resulting in men and women clamoring over 4-wheel drive luxury pickups and SUVs that are used mostly for the daily commute and grocery run. Without the passion, focus and realignment to the changing world, IBM, GM and hundreds of other companies would fail to exist. (I know, I’m not even mentioning the government bail out of GM. That’s a whole ‘nother story….) Of course, there’s no sin in lost passion either, Mr Buggy Whips. That’s ok too…and a subject for a whole ‘nother post on repurposing your brand…and I have a real world (me) example for you! Stay tuned…. But if you want it, you can have it. Your wish is my command. Just shake it up and do something! What are you doing to evolve your business? Look around. How many changes have you made in your business this year, this month or this week? I bet something could use a new coat of paint…of a different color even! Go outside. Look at your sign. Is it bright, clean and shiny? Or is the paint all chipped and crusty? Challenge of the day: Change something today, just for change sake. Shake it up. Trust me. You’re customers will notice and love you even more!